For the Indian film, see Action Replayy. For the Howard Jones EP, see Action Replay (EP). For slow motion video effect used in sport broadcasting, see instant replay. 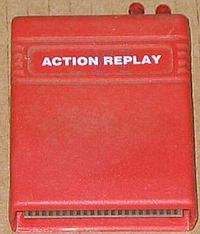 Action Replay is the brand name of a cheating device (such as cheat cartridges) created by Datel. The Action Replay is available for many gaming systems including the Nintendo DS, Nintendo DSi, Nintendo 3DS, PlayStation Portable, PlayStation 2, GameCube, Game Boy Advance, and the Xbox. Infinite lives, invulnerability, permanent power-ups, no collision detection, walk through walls, one-hit kills, super-high jumps, infinite money, etc. The ability to download, upload, import and export saved games to the Internet or a storage device. Allowing the player to save the game state to disk, so that the game can be restarted from that point even if it does not support saving. Loading of third-party (homebrew) applications/games, not backup copies of retail games. Power-Saves by Action Replay are a related series of video-game cheat devices. Unlike the main Action Replay series, which cheats by modifying the game code itself, Power-Saves store the game saves created by Datel, allowing users to cheat without modifying the game code being executed. Power-Saves are available for game systems such as the Wii on an SD card and the Nintendo 3DS. The ISA-based Action Replay needs memory-resident drivers for both the real and protected mode. The card has a grabber, a trainer, and a slowdown feature. It can also interrupt the current game or save it to disk (freezer). Models running firmware 4.0 and beyond use EEPROM instead of ROM and thus are upgradeable. In December 1998, Datel released a version for Windows 95/98. Action Replay DSi (October 2009); Later system software updates to the DSi and 3DS include a 'white list' which prevents unlicensed games from booting, this stops older Action Replays from loading on updated DSi and 3DS handhelds, however older Action Replays will continue to work on original DS and DS Lite handhelds. Action Replay Power Saves for 3DS (June 2013). The Action Replay Power Saves for 3DS can alter saves of 3DS games and has some codes for 3DS games. ^ "Datel Trainer Toolkit for Nintendo DS– User Manual" (PDF). Datel. 2007. Archived from the original (PDF) on 2009-10-07. Retrieved 2009-05-07. ^ blasty (2010-02-01). "Lawsuit coming in 3.. 2.. 1". HackMii. Archived from the original on 2010-04-09. Retrieved 2015-11-29.